Carry enough extra clothing to get you through the worst weather that may happen that time of year. Don't listen to the weather forecasters: they lie all the time. On the other hand, if the forecast is for snow to 4,000 feet, don't convince yourself that the storm will stay at bay just because you want it to. I have had people offer me money for my wool pants or my rain parka. We are dealing with the rule of threes. You can survive three weeks without food, three days without water, and three hours without warmth. If the weather turns bad and you don't have sufficient clothing, you can die from hypothermia. If you don't die, you will be really, really uncomfortable. You'll be uncomfortable enough just climbing out, so why ask for more trouble? In summer, your main concern with clothing is to keep cool and keep from getting sunburned (hint: hiking down in a bathing suit will not give you a golden tan: it will parboil you). The worst weather you are likely to encounter would be a thunderstorm. So shorts and tee shirt, or long pants and shirt to protect from sun, a hat with a brim, and a light raincoat would suffice. Think about doing laundry. What comes out of the drier absolute last? Cotton denims, cotton tee shirts, cotton sweat shirts. What do most people hike in, winter or summer? Cotton denims, cotton tee shirts, cotton sweat shirts. Cotton is preferred during summer when you want to be damp. When that wet clothing is on your bod and the weather turns bad, you will be very, very cold. Alternatives to cotton are wool, coolmax, thermax, polypropylene, or any of a number of "active" synthetic fabrics on the market nowadays. They can be found on sale most of the year. 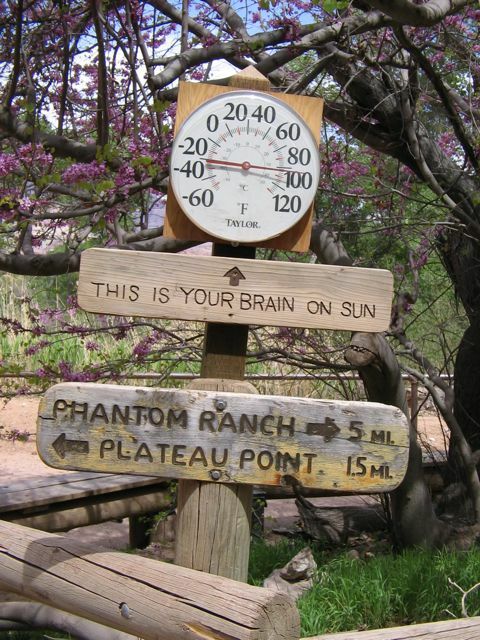 Yeah, the tee shirts they sell at Phantom Ranch are cotton. No one says you have to hike out in them. July, August, September: highs in the 100's -- up to 120 degrees. Lows in the 90's. Chance of afternoon thunderstorms. Usually not rain at night, but possible. October through early November: highs in the 80's to 90's. Little chance of rain. Can snow, but unlikely. Late November, December, January, February. Highs in the 40's to 60's. Lows below freezing. 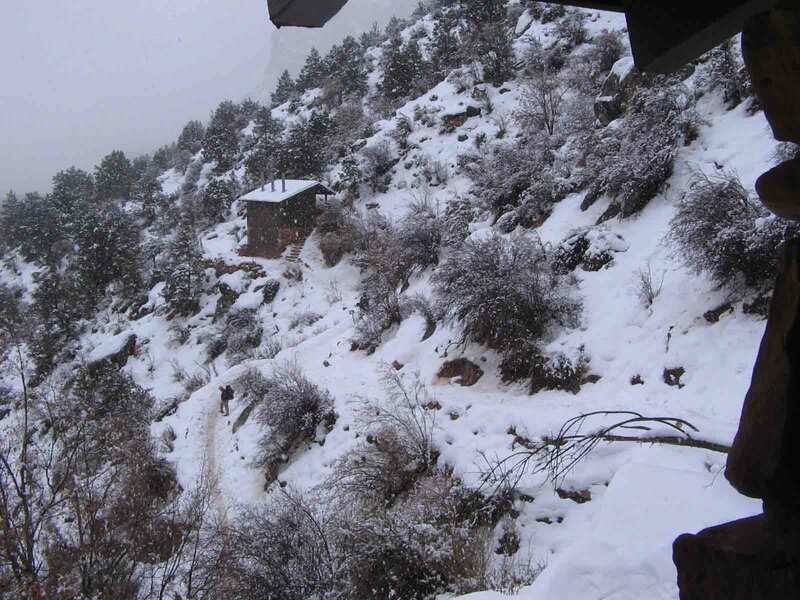 Can snow anytime, all the way to the bottom of the Canyon. Usually windy. March, April, early May. Highs in the 80's to 90's. May snow, but unlikely. May rain. Late May, June. Highs in the 90's to 100's. Little chance of rain. Small chance of snow through end of May. This means that even us die-hard "be prepared" types wouldn't carry a heavy parka into the Canyon in June, but we certainly would in December. Yeah, most of the time you will end up carrying the extra clothes back out. But the one time that you get caught in a storm and have all the clothes you need will be worth it. © 2009-2010 Phantomphiles, Marjorie "Slim" Woodruff, All rights reserved.